Scott Muscat (centre) celebrates his European Championship victory with team-mates and fans in Ireland. 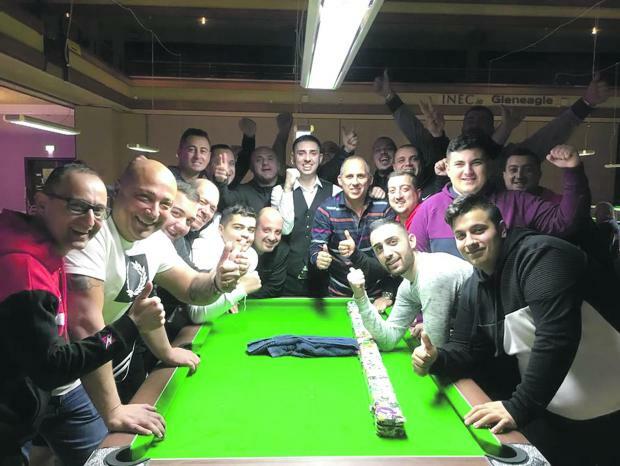 Scott Muscat’s triumph at the European Championships in Ireland has been a huge shot in the arm for the sport of pool in Malta. The young player lifted the continental title last month when he defeated Irishman Cormac Kerr 7-5 in the final. It was a case of third time lucky for Muscat who had lost his previous two final appearances in international tournaments, the others coming in the world championships and the European Championship at U-18 level. The match kicked off remarkably for Muscat. After losing the first frame, Muscat went on to draw and eventually gain a four-frame cushion lead for 6-2. However, at this point nerves started to cripple into Muscat’s mind. The Irish player got back into the game when winning three frames in a row for 6-5. But Muscat kept control of his nerves to win the crucial frame and secure the title. “I felt so relieved after potting the final black,” Muscat told the Times of Malta. “After all those sacrifices, the only thing I wanted at that moment was to win. Despite the sizeable number of people who joined the Maltese contingent in Ireland to support the team, Muscat lamented the lack of coverage the Malta teams were given, even though one of the European champions is now actually Maltese. He made reference to Anton Cuschieri who became the World Masters champion in 2013, something Muscat said is the pinnacle of pool achievements. Added to that the Malta U-23 team has won three titles in the last four years. “All these players make a bunch of sacrifices, and it shows,” Muscat said. The 21-year old will be defending his title infront of his friends as the 2020 European Championships will be held in Malta. Asked if this would be of an advantage to him, Muscat said: “The fact that next year’s tournament will take place in Malta helps with the team’s exposure, especially in terms of support,” he said. Muscat expressed his amazement at how word spread about his win around his hometown Żejtun and how people have been congratulating him and his family. “The bar in which I train daily has put up a picture of me on the wall and they let everyone know that ‘this is where the European champion trains’,” he said. Muscat admitted that his plan at this stage is to explore ways towards going professional. “The association has been very supportive, covering all of our expenses when the national teams play abroad,” he said. “But when the tournaments are not meant for teams, it tends to get very expensive.